You should have arrived from the talented Zinia Redo. If you're just popping in you can start the beginning of the hop with the Altenew Card Blog. Yes, I said giveaway up there! To celebrate this release, Altenew is giving away a $50 gift certificate to 6 lucky winners! Please leave a comment on the Altenew Card Blog and/or Altenew Scrapbook Blog by 2/13/2019 for a chance to win. 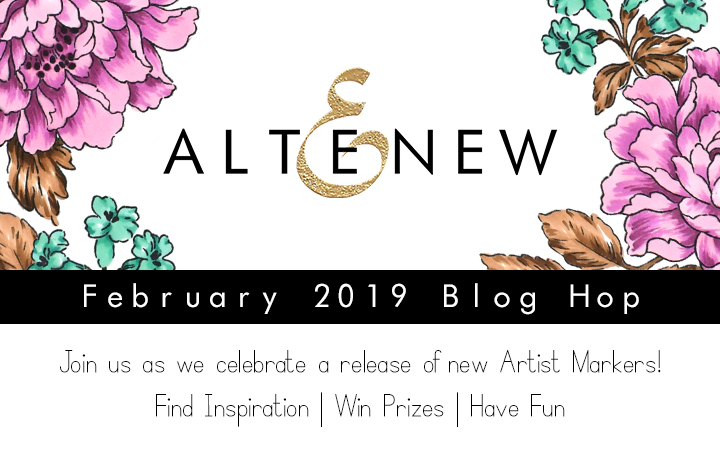 Six winners will be announced on the Altenew blogs on 2/16/2019. I super love the colors in this set. The blue greens are just gorgeous and they pair so well with the purpleish pinks :) So you know that meant flowers for me. I can't help myself. I haven't used the Whimsical Flowers in a super long time so I thought they'd be a good set to break out. 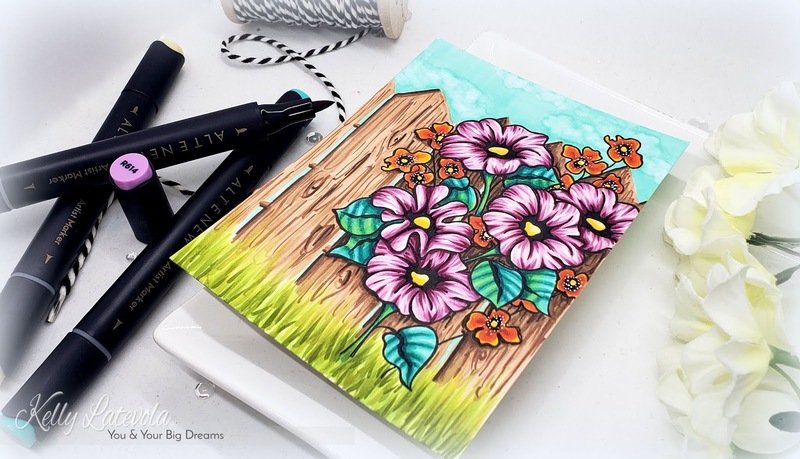 I stamped and masked them to create a floral bundle and then drew in stems to bring all the blooms together. I really wanted to put them up against a fence so I could use the browns in the set but I was scared to free hand draw it. The little cheat I came up with worked perfect. 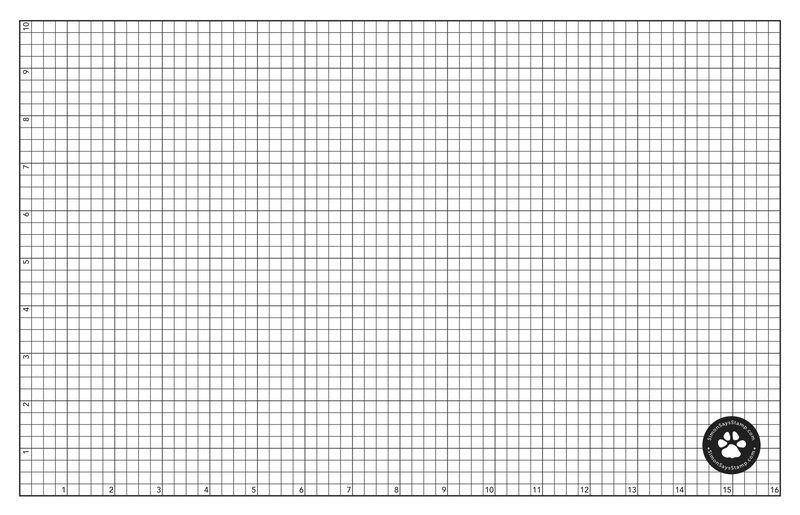 I used a t square ruler and a pence to put my fence where I wanted. You can't color over pencil with alcohol markers because it traps it in. So I came up with a work around. I colored up to the line leaving a slight white edge between my marker and the pencil line. Then I erased the pencil and filled it in. This way I had an outline to follow, I could still get the no line look I was going for, and my lines were all wonky haha. And I finally got the video edited. You can check it out below. Your next stop is the always amazing Therese Calvird. Here's the whole list in case you get lost along the way. Beautiful and so detailed. I love these colors in this set too! Very nicely done. Looking forward to the video later on. Wonderful card - such wonderful rich colouring! Beautiful unique card! I love the colors in this release! Awesome coloring using the new markers!! Kelly, your coloring always takes my breath away and I just love your videos also. I'm impressed with your fence "cheat". Very clever! TFS! So pretty, Kelly! Love the hand drawn effect & the gorgeous colors! Can't wait to see your video! Beautiful work. And to draw the fence behind it is amazing. I will check back for you video for sure. Oh.. 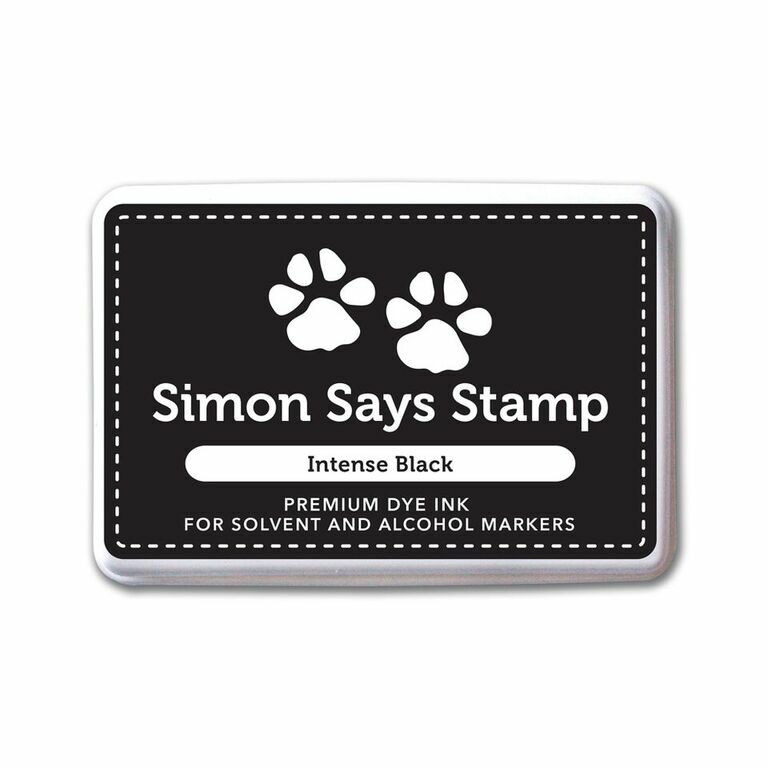 This a great amazing twist for using altenew stamp . Love every single detail you added for this card . Fabulous work on this card.. I love the scene you created!! Fabulous coloring!! I love the new colors as well as the older sets. You've done a great job coloring the card. Beautiful card. Your coloring is amazing and I love the layout. Your card is amazing! Great colors. Amazing coloring-even for you, Kelly! Love your work always. It's fascinating how you color your images! I wish I had your patience. Your card is so dynamic. Beautiful colors! Thanks for sharing! WOW! This is incredible! Your coloring is FABULOUS! Such gorgeous colors! Love your card Kelly, fabulous coloring as always! !Thanks for the inspiration! I’m so looking forward to your video,love watching and listening to you. Stunning card x.
Unbelievable Beautiful card/colors! 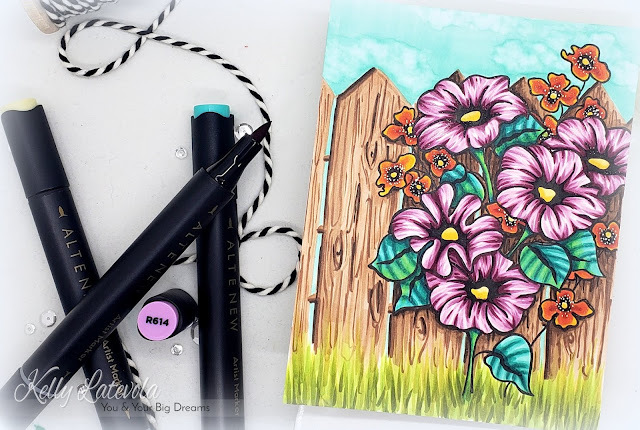 These markers sets are jewels just like the flower sets! Wow! Love all the details on your card. Gorgeous job! Gorgeous card! Love the colors and the scene! Sweet card! Love the pretty flowers next to the fence. Almost feel as if I could walk by and pick one! Thanks for sharing. 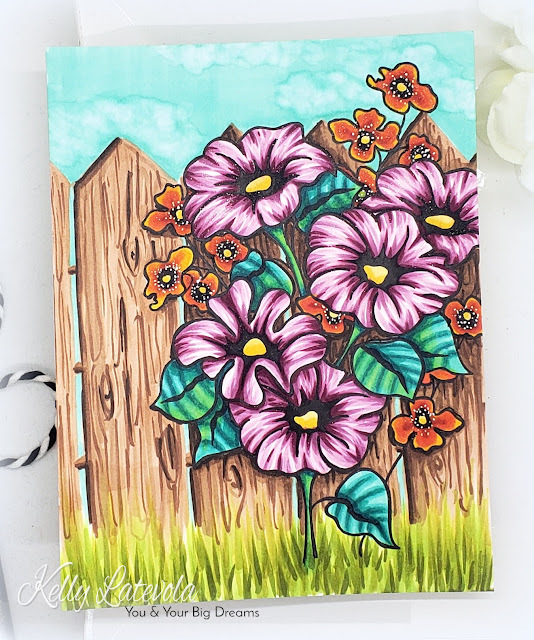 Kelly, I really love everything about your card....the sky, the fence, the grass, and of course, the stunning flowers!! Your coloring is just superb! Kelly you did an amazing job ! Beautiful scene with the flowers on the fence. Absolutely stunning card. I love the fence background. What an innovative idea...but I am too scared to try free-handing something like that! Gorgeous card. Your fence background is very interesting and adding a sky makes this card very complete. Your florals are beautiful. I want to thank you for sharing your time and talent with us. This is another fabulous release, those new colors are gorgeous, and so is your project, thanks for the inspiration! Fabulous card. Gorgeous colours in the new release. I am looking forward to your process video. A great card Kelly with such a clever use of images! Shows off the great new marker colours wonderfully! Thanks so much for sharing your great inspiration! Beautiful and colorful, so you!!!! I love it as I do all your cards. Can't wait for the video!!!! So vivid and real looking!! I love the stamp set you used to showcase these markers. Your coloring and blending is fabulous. I am so glad they made these markers in three Color families so it is so easy to blend. Your card is awesome!! Wow, I can't believe you hand-drew that fence! It looks amazing. What a lovely scene! It's perfect with these colors!!! Thanks so much for sharing and inspiring!!! Fantastic way around trapping pencil under market, & totally realistic looking. Brilliant colouring as always. Hope you get chance to edit & post video no matter how long down the road, oh & a story !!! Thank you Kelly. Beautiful card and I love that fence look. Looking forward to seeing the video because I'm not sure how you created it! But it is awesome! Loving these newest markers so much. Hope mine come soon! I want to play now! Beautiful card!! Your coloring is always amazing. You did an amazing job on this card! I love your coloring and the design of this card is so pretty. I'll check back later for the video! Wow! This looks so pretty and real! I am so happy to see the browns in this set. Such a beautiful card Kelly - and there was no doubt in my mind that you would do a "scene"! I love all of your cards - you put so much gorgeous detail in them! You also tell the best stories! Thanks! I love your card! I can't wait to see the video. I love the look of the fence in the background. It's all beautiful! Thank you for the inspiration! Your card is gorgeous! Your coloring is flawless. The flowers are so bright and beautiful! I hope you get the video up soon. I really want to see how you did the fence and grass. I have a hard time freehanding grass. I can never seen to get a good color blending combo. Yours looks great! You're a wizard at color work. Thanks for sharing your skills! WOW Kelly, what a beautiful card! You have mad coloring skills! Gorgeous Card! I love the fence. Wow! Your card is awesome! I love how you made your own fence, great job! Your coloring is dpot on! What a gorgeous card . I love how you did the fence and putting the flowers against it made them pop. I love the brown as that is the one color that is so hard to find in just the desires shade,wow to making a great brown. Thank you for sharing your talents. Awesome card Kelly! Love how you did your colouring and I am always a little jealous on the way you so easily make stunning wood. Gorgeous story and I hope you have a great time with your girlfriend and Goddaughter. 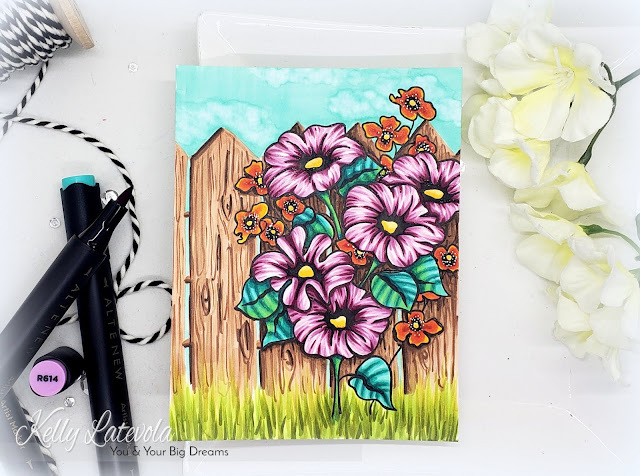 Kelly, I love this card and I think that you did a SUPERB job on this fence! Such a creative way to really get a lot of use out of these wonderful new colors in this market set! I love how you show us to create the fence too; super great! I am gonna have to try this more often and I really love your work. SUPERB!! !